What should you keep in mind during the first days following a wrist joint denervation? Does a wrist joint denervation require casting? How long will the stitches have to remain in place after undergoing a wrist joint denervation? How often does the dressing have to be changed? How long does one have to wear a bandage after a wrist joint denervation? Does a patient have to take drugs after a wrist joint denervation? When can a hand that underwent a wrist joint denervation be put to full use again? Is it necessary to receive physiotherapy following a wrist joint denervation? What should a patient receiving physiotherapy following a wrist joint denervation focus on? Are the surgery scars in connection with a wrist joint denervation very prominent? Is it possible for the pain to return in a wrist that had a wrist joint denervation? A denervation procedure will leave you with several smaller incision wounds on the wrist. Like every other surgical wound each of those small incisions requires careful monitoring. This is the only way to secure a regular healing course. Swellings and Reddenings during the wound healing process are a rare occurrence, but they are possible. Short-term immobilization of the wrist joint following a surgical procedure. This is not a mandatory requirement. A number of hand surgeons will however prefer to apply a cast even after surgery on soft tissues. The reason is that a cast will help reduce the pain as well as prevent early straining. The image shows a typical cast for short-term immobilization on a wrist. Please note that only the wrist joint was immobilized. The fingers and the thumb have been kept mobile. All not concerned fingers and the thumb should in fact be moved shortly after surgery to help retain mobility. On a properly healing wound the stitches may be pulled after ten to fourteen days. The process of suture removal on a hand or forearm is usually not painful. 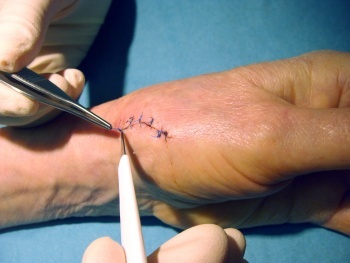 When removing the stitches as shown in the image the patient will not experience any pain, just a slight pulling sensation when the suture is lifted up by the tweezers. If the wound shows a proper healing course I usually change the dressing in connection with the inspection two to three times during the first weeks following surgery. One to two dressing changes may suffice in a well progressing wound. One to two days after removing the sutures no further bandage/dressing is required, as long as the wound healing process is regular. I usually apply a cast after each wrist joint denervation procedure. In most cases I remove the cast a few days after the procedure and replace it by a well-padded bandage which has to stay on for about two weeks to protect the wound from external influences. If the patient experiences pain or swellings in the operated area he/she should also consider – above and beyond the cast immobilization – the use of anti-rheumatics such as Voltaren®, Ibuprofen®, Arcoxia® or any other similar agents. These drugs do not only have an impact on the pain they also serve to reduce the swelling and therefore support the healing process. I do however not recommend using these drugs without previous consultation of the treating GP (general practitioner) since these drugs do have a variety of side-effects (e.g. risk of stomach ulcer or duodenal ulcer). The surgery related pain usually responds very well to conventional pain killers such as Novalgin® or Paracetamol®. The treating physician will determine the exact time as to when a hand that underwent such surgery may be put to full use. Not only the actual surgery will determine the selection of the appropriate timing, but also the reasons which lead to the wrist joint denervation will have to be carefully evaluated. This really varies from individual to individual. Many patients who had surgery put their hand to use with good results shortly after the stitches were removed. For these patients the day-to-day activities represent the best form of exercise. Physical exercises through individual motion in lukewarm water. I do recommend independent exercises like regular hand baths in lukewarm water (5 x 5 minutes daily) for about six weeks. This kind of individual exercise however may only be started once the stitches were removed. The wound has to have healed properly! It is also recommendable to repeatedly apply greasy ointments to the surgical scars on the wrist. Patients, who show a slower healing progress than usually experienced, should consider starting with professional physiotherapy as early as possible. It is of utmost importance that the exercises in connection with the physiotherapy never cause pain or even swellings in the wrist! A too intense exercise regimen is rather counter-productive to the healing process and may even lead to mobility malfunctions (and swellings). A patient should consider changing a physiotherapist who is not willing to address the individual needs of the patient. Surgery on a wrist does require patience on both sides, the recovering patient as well as the healthcare provider. First of all, please note that scars on hands typically are much more sensitive for a longer period of time than scars in other body parts. The esthetic appearance of a scar varies from patient to patient. Some individuals have a genetic tendency to form keloid scarring. The vast majority of scars on a hand or forearm however should recede within a year and become pale and barely visible! Yes. This is possible. A progressing osteoarthritis is responsible for such development in most cases. If this happens a patient should consider a partial fusion or even a total fusion of the wrist joint. However, prior to committing to such serious intervention a patient should investigate into alternative therapy approaches such as leech therapy.